Translation Tribulations: Meltdown! Could this be YOUR laptop? In 2010 I spent about €1800 on a Lenovo laptop. I wanted to have the best equipment available to do my work. I needed something reliable that would survive many hours of working per day and would not make any problems when I’m on the road, which I am quite frequently. Well – who would have thought that it would only last 3 years? Last weekend I was sitting at my dining room table, typing a comment in the NT group on Facebook while taking a break from work. Thank God my dining room table is made of glass! Because, while I was typing, I suddenly noticed a hissing sound that came from my laptop. And within a second, there was an explosion! It was followed by a flame darting out from the back and at me from the gap between the keyboard and the screen. And yes, I still had my fingers on the keys – that’s how fast it went (and flying battery parts and the flames did burn the back of my hands, my arms, my fingertips and I had three holes in my t-shirt – but not bad burns! They’ve healed already!) .I jumped up from the table and ran down the hallway to get my fire extinguisher. Meanwhile my husband was trying to put out the fire using a towel. But that didn’t help. More fire, more smoke, lots of smoke! I handed him the fire extinguisher and he fired it off, but that didn’t help either, since the home edition is not made to fight chemical fires. So I called the fire department and asked them what to do and the guy on the phone asked: Can you bring it outside and water it from a safe distance? My dining room, which is open to the kitchen and the living room, had meanwhile filled up with nasty smelling smoke that made me choke. 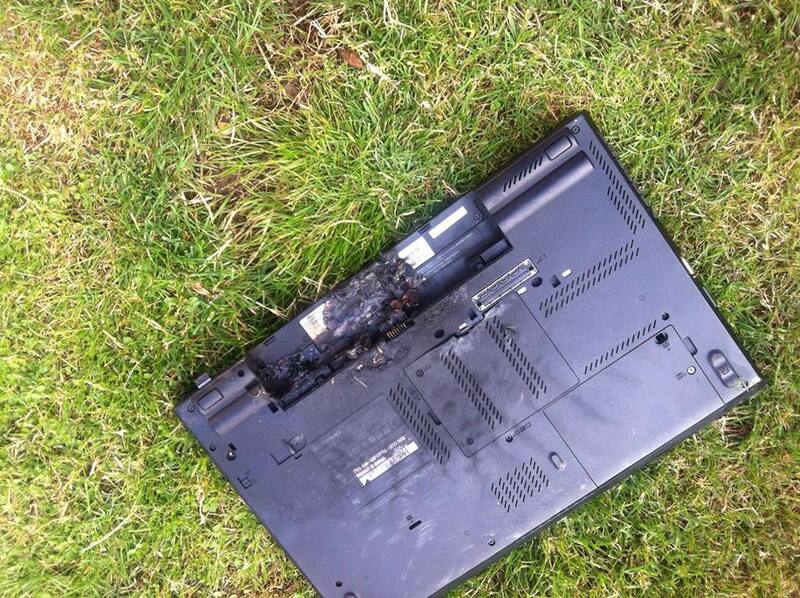 My husband tried grabbing the laptop to take it outside onto our patio and from there into the garden. But it kept on literally spitting flames and smoke. Eventually he managed to grab it and throw it onto the lawn in our garden. 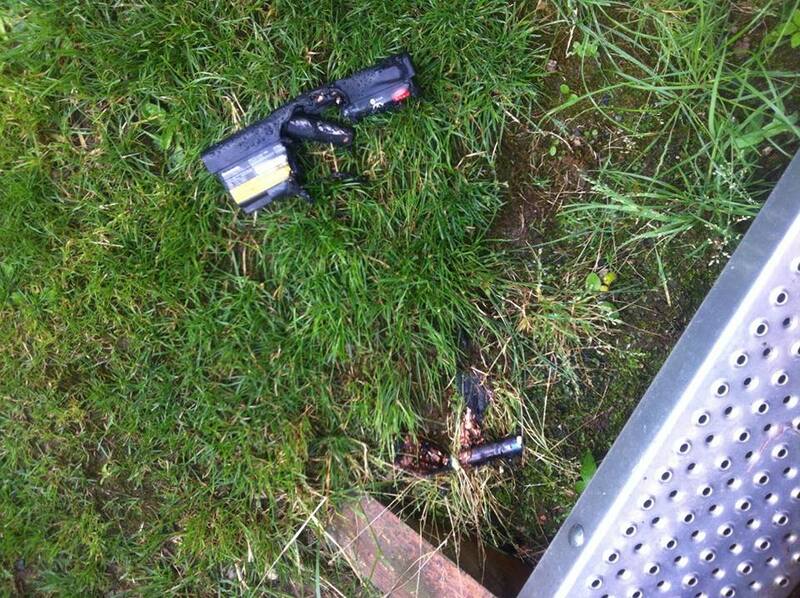 While it was flying through the air, there was a second huge explosion that blew the battery pack off the laptop. The parts landed several feet apart from each other on the lawn and we tried putting the fire out with water. There was another explosion, worse than the previous ones, and the damp grass actually started to burn. Eventually the water did put the fire out. All of this happened within no more than 120 seconds. Since the battery pack was literally blown off the laptop and the laptop wasn’t hit with water, the hard drive survived. At least I didn’t lose any of my data. But as you can see in the pictures, the entire thing is simply waste now. So – what had happened actually? I don’t know. I only know that I kept my laptop hooked up to the power cord at all times when I was in my office. I hardly ever shut it down. It wasn’t hot the day it happened. There was no direct sunlight. And had it happened 4 hours earlier, nobody would’ve been at home (except for my son who was asleep in his room on the first floor of our house. Would he have woken up in time to escape?). If it would’ve happened 24 hours earlier, I would have had that laptop on my lap. I don’t even want to think about what could have happened to my son or my legs. So far, Lenovo hasn’t really responded to this case. And many of my colleagues are worried about their laptops (Lenovo is a popular brand among them). But I will be sure to keep them posted on what Lenovo has to say. Perhaps an entire battery pack series is affected, who knows. Truth is: This should not happen! The main board usually has an emergency shutdown for when the battery pack gets too hot. Well, it failed in my case and to be honest, this incident scared the heck out of me. I don’t handle such situations very well. I don’t know what would have happened, if my husband hadn’t been there. I would have freaked. And I don’t know what would have happened, had there been stacks of paper on the table as there are on my desk in my home office. What did I learn? My next laptop is an Apple Mac Book Pro. They say that the battery pack is safe. I don’t know if that’s true. But I will make sure that I turn the laptop off whenever I’m traveling or I’m not around. Wow, that's scary! I'm somewhat comforted in my long-held belief that all computers are best powered down when left unattended for prolonged periods, including overnight. Smart man, Rob. That saves on the electricity bill too, of course. People forget or don't know how much power gets sucked up in sleep and standby modes. I'm not sure that the switch to Apple will lead to any improvement in safety however much better the user experience may be otherwise. If my memory hasn't flamed out completely, I seem to recall that when Apple introduced this battery technology many years ago there were a lot of incidents similar to Tanya's experience. What I do find a little disturbing is the lack of response from the manufacturer (Lenovo) so far. What is wrong with their customer service?! I'm guessing Lenovo belongs to the ranks of faceless companies who are mainly interested in selling high volumes at low margins, and as such are pretty much uninterested in what pesky customers think, particularly when those customers have something to complain about. Interesting article Kevin. In 2006 Dell recalled over 4 million laptops using Sony lithium-ion batteries that were also used in Apple powerbooks (so maybe no sure thing switching to Apple just for that). 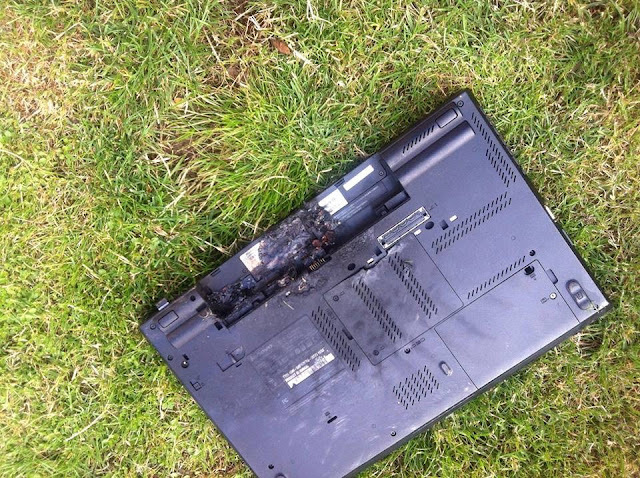 The recall was swiftly followed by Toshiba and Lenovo... also using the same Sony batteries. I think Sony then recalled them too, so a very expensive mistake with the type of battery they made at the time. The best advice seems to be don't charge your laptop for more than 8-hrs at a time. I try to run mine down regularly even when working at home as I think it helps to extend the battery life so it lasts longer when I'm travelling. I don't know if that's true or not... but it feels like it works. Most laptop batteries are manufactured by Japanese companies AFAIK. Of course, whoever makes the batteries doesn't change anything to the fact Lenovo is responsible for the whole unit. I'd just be interested in knowing the laptop model and the battery involved. Shocking to hear this..But nowadays it happens with every gadgets.As you said its better to turn off our system when we are not around to it.